Russell has over thirty years of extensive experience in the electrical industry. 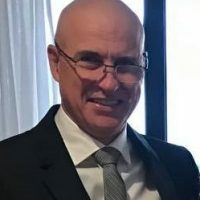 Throughout this time Russell has accomplished the reputation of being a highly sought-after electrician known for his technical knowledge and innovative approach. He is able to provide quick and accurate electrical/technical solutions to our clients. Under Russell’s guidance Electric NT specialises in the electrical component of large commercial air-conditioning systems and commercial Building Management Systems (BMS). Electric NT are known to both meet and exceed client expectations due to the quality of work Russell expects our team to produce on every small, medium and large project we undertake. 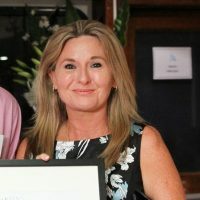 Janene is responsible for Business Management, Training, Quality Assurance, Occupational Health and Safety, Marketing, Human Resources, Accounts and all aspects of Business Administration. Janene is also responsible for payment of Employees, Sub-Contractors within terms and for the control and management of all documents. Janene in liaison with our Accountant is also responsible for ensuring compliance with our business and taxation requirements. Mathew, undertook a double degree in Engineering and Computer Science. Mathew has extensive knowledge in Controls, Automation and Design of Building Management Systems (BMS). Mathew’s knowledge and commitment to ensuring positive outcomes and innovative effective solutions is an asset to Electric NT and our clients. Mathew produces Electric NT’s CAD drawings and all of our labels are created in house. Mathew has extensive experience with the programming of PLC and DDC systems. Mitchell Hore has been with Electric NT for 7 years. Mitchell has exceptional attention to detail and is very proactive in his work practices and processes. Mitchell’s strengths also lay in his ability to lead a team and ensure that onsite morale and productivity is always at a high standard. As well as winning the Master Builders – 2014 – Overall and Electrical Apprentice of the Year, Mitchell was a finalist in the Northern Territory Training Awards in the category of Vocational Student of the Year for his dual role as Electrician/Safety Officer with Electric NT, after undertaking his Certificate IV in Occupational Health and Safety. 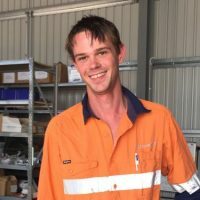 Liam is a meticulous worker and quiet achiever whose work practices have proven to show outstanding results for Electric NT and our clients. Liam is currently undertaking his Diploma of Project Management. Liam’s exceptional trade school results and onsite achievements have led him to win and participate in the following awards. 2018 – Winner – NECA (SA/NT) – Industrial Apprentice of the Year. 2018 – Runner Up – NECA (National) – Industrial Apprentice of the Year. 2018 – Finalist – NT Training Awards – Austin Asche Apprentice of the Year. 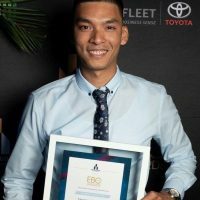 2017 – Master Builders – Winner – Electrical Apprentice of the Year. 2014 – Winner – Northern Territory Training Awards – School Based Apprentice of the Year. 2014 – Winner – Master Builders – School Based Apprentice of the Year. 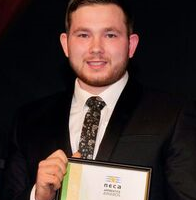 2014 – Runner Up – NECA (National) – Commitment to Industry School Student. 2014 – Winner – Northern Territory Board of Studies – Most Outstanding School-Based Apprentice/Trainee of the Year Award. Tom has been with Electric NT for 5 years. Tom’s proactive approach and love of his trade lead him to win and participate in the following awards. 2016 – Winner – Master Builders – Overall Apprentice of the Year. 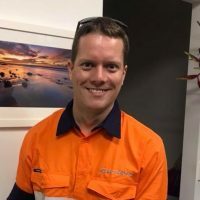 Tom shows outstanding commitment to Electric NT’s strategy of continually learning and has been recognised as a pro-active team member who strives for excellence in all works that he undertakes. Tom specialises in the manufacture of Electrical Switchboards, his wiring is attention to detail have awarded him many accolades from our clients and suppliers. Serdy has recently completed his electrical apprenticeship with Electric NT. As well as being a qualified Electrician Serdy also holds a Diploma in Information Technology and it was his love of innovative technology lead him to undertake an apprenticeship in the electrical industry. 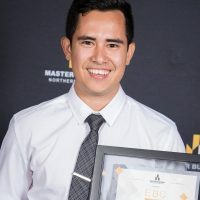 Serdy was the winner of the 2018 – Master Builders – Electrical Apprentice of the Year and also the runner up of the 2018 – Master Builders – Overall Apprentice of the Year award. Jesse is Electric NT’s latest addition to the team. 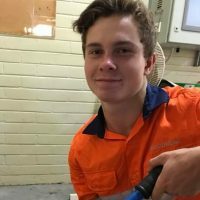 Jesse is currently studying at Darwin High and has commenced his school based apprenticeship with us.